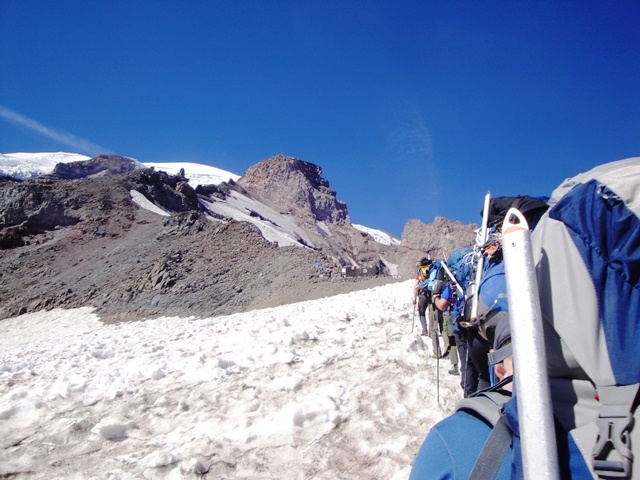 “It doesn’t get any better than this,” Sara, our IMG guide, expressed as we climbed up the Disappointment Cleaver on the way to the summit of Mount Rainier. She was referring to the perfect weather conditions we had been blessed with this entire trip. Our guides set a steady pace for the six of us in the group on summit day. Next we traversed Emmons Glacier; the largest glacier in the lower 48 states. 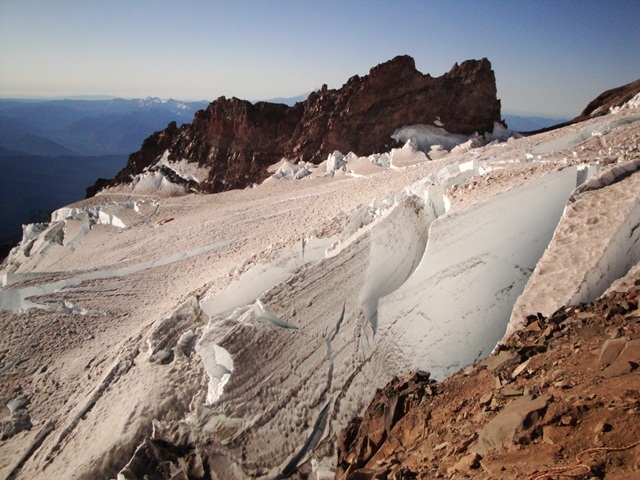 Emmons spans about 4 square miles of the mountain near Little Tahoma peak. 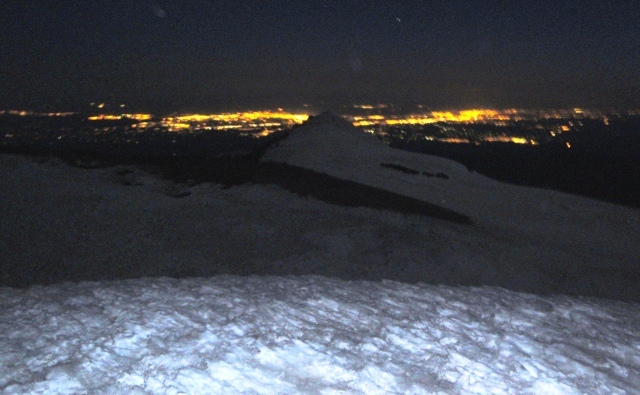 Before dawn at roughly 5am our team summited Mount Rainier on Tuesday, September 4th, 2012. We impressed our guides with our quick yet steady pace. The first ones at the top for the day, we had the crater and the summit to ourselves. Seattle’s lights flickered in the distance where hundreds of thousands of people lay snuggled in their beds. Three days ago I was a little unsure if I would make it to the top. The mountain beckoned yet taunted me as we drove to Ashford from Seattle. We arrived at IMG Headquarters on Saturday where we met our head guide, Austin and our fellow climbers in the group. One climber with us has completed 6 out of the 7 summits in the world and was training for Everest. His stories were intense and inspiring me to check some off as well. Austin briefed us on what to expect and helped us lighten our packs with unnecessary items that could slow us down. 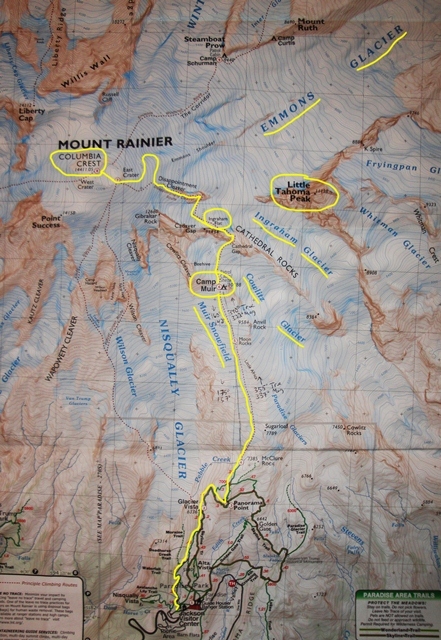 Sunday morning we began our climb from Paradise Park up to Camp Muir. About 5 hours later we made it to camp with plenty of time for rest and relaxation. Austin reminded us multiple times to eat a ton and drink plenty of water. He called it “fueling the tank” for summit day. 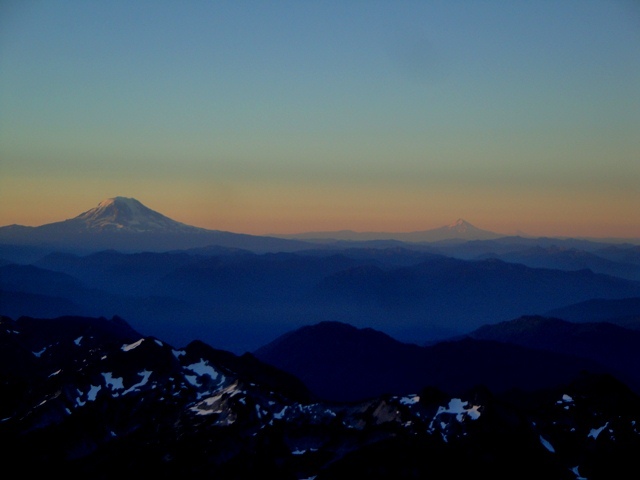 From Camp Muir we saw Mount St Helens and Mount Adams to the south. Even further south in Oregon we saw Mount Hood and Mount Jefferson which is about 150 miles away. We slept in the Gambu hut that evening at Camp Muir. It was cozy yet spacious for all of us in the group. 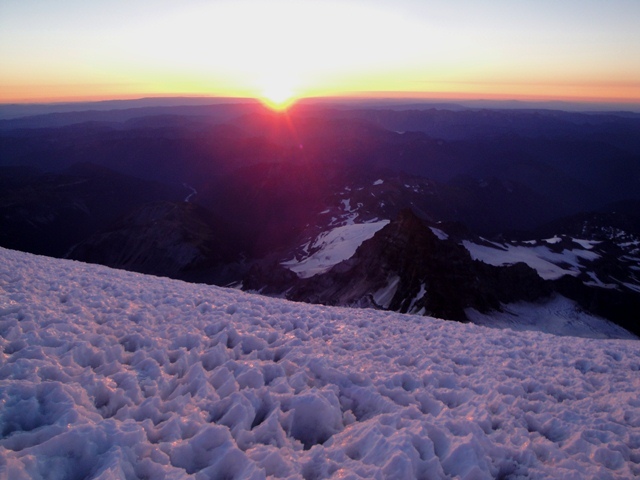 On Monday morning we fueled up with pancakes and bacon before practicing our self-arrest drills on the Cowlitz Glacier. Once our guides were satisfied with our drills, we packed up and made our way to the Cathedral Gap. An hour and a half later we traversed into camp at Ingraham Flats. Little Tahoma stood tall in front of camp as if it were standing guard. Austin briefed us with what to expect and to be ready for a long day tomorrow. He advised us to constantly check in with ourselves to make sure we have enough energy to make it back down the mountain, when most injuries occur. Sleep was close to impossible at 5pm that evening. I may have gotten 2 hours out of the 6 hours we had available. Rest was imperative for the journey ahead of us. We got out of our tents at 11pm and began our climb at 12:30am. Shortly after hitting the trail, we crossed two ladder bridges over crevasses. 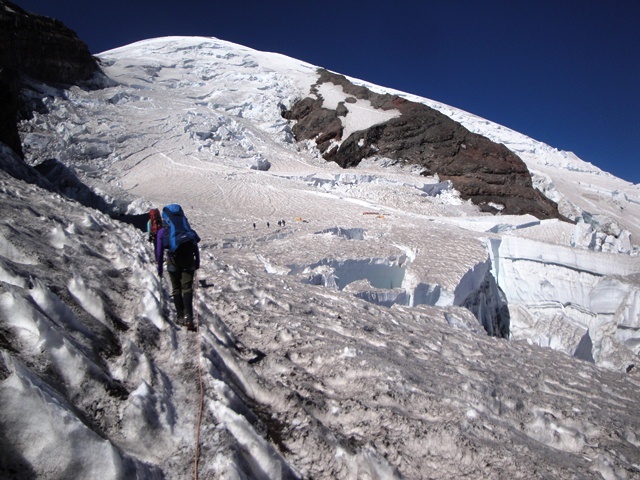 We crossed dozens of crevasses throughout our climb. In 4 hours and 15 minutes we made it to the East Crater and signed the register for the summit. We dropped our packs at the crater rim and climbed the couple hundred feet up to Columbia Crest; the true summit of Mount Rainier. The wind whipped strongly as we celebrated with the group. 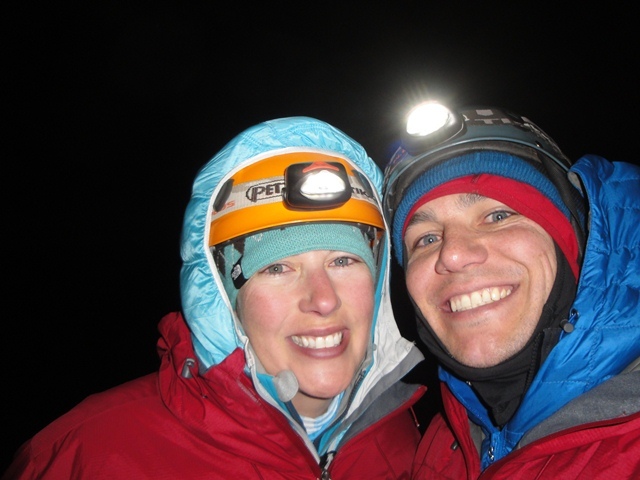 Taking pictures at the summit proved difficult since it was still incredibly dark. Sunrise barely broke with hues of pinks, oranges and reds to the east. We grabbed our packs at the edge of the crater and fueled up for the long descent ahead. I noticed my vision was a tad blurry. I thought, “not again” referring to the last time it happened on Mount Kilimanjaro in 2007. I had Lasik Zyoptix corrective surgery about ten years ago. Now when I go to higher altitudes, my eyes are more susceptible to the low pressure and low oxygen levels resulting in blurred vision. It didn’t stop me from making it down safely, thank goodness. Thirteen hours after starting our ascent to the summit, we finally made it back down to Paradise. It was a long, strenuous journey but well worth the effort. The guides at IMG took good care of us and made this a truly rewarding experience which we will cherish for many years to come. Posted by jingerventures on September 9, 2012 in All adVentures, Pacific Northwest and tagged Backpacking, Camp Muir, Climbing Mount Rainier, Columbia Crest, Cowlitz Glacier, disappointment cleaver, Emmons Glacier, Everest Training, IMG, Ingraham Glacier, Little Tahoma, Mount Rainier, mount st helens, Mountain Climbing, summit day, Summit of Mount Rainier, Travel. Way to go Josh and Jing. Loved the video. I loved the video inside the blog! Wow what an experience!